Offering rugged terrain that will challenge any outdoors enthusiast, visitors who traverse the steep, backwoods trails of Gorges State Park will be rewarded with views of dazzling waterfalls or perhaps an encounter with one of the numerous rare species of the park. However, some of the more secluded areas of the park are not recommended for casual hiking. One of the park’s most popular pathways is the Foothills Trail. Established by Duke Energy, the trail winds along the southern portion of the state park and wraps around Lake Jocassee, where primitive campsites are available. The trailhead is located at the Frozen Creek access area in Rosman on Frozen Creek Road. This area provides parking, picnic areas and trailheads. Location: Use the Frozen Creek Access on Frozen Creek Road, in Rosman. This access provides a picnic area and trail head for equestrian, mountain biking, and hiking trails. The Auger Hole Trail cuts directly through the heart of the park. Horses and mountain bikes are permitted on the Auger Hole Trail from the Frozen Creek Access to Turkey Pen Gap on the western boundary of Gorges State Park. Horses and mountain bikes are not permitted beyond Turkey Pen Gap. This trail also serves as a connector from Frozen Creek Access to the Foothills Trail. There are two low water crossings that must be waded across along the trail, one at the Toxaway River and one at Bearwallow Creek. Under normal conditions the water level is about knee deep. However, water levels can rise unexpectedly with high rainfall, making these crossings impassable. Downed trees and landslides are another hazard hikers should be aware of. The terrain is steep with thick vegetation on either side of the trail and venturing off-trail in search of waterfalls is not recommended. Location: Use the Grassy Ridge Access entrance off of Hwy 281 South, in Sapphire. This trail is accessible from the Bearwallow and White Pines Picnic areas, and via the Visitor Center Connector trail. This is a short but strenuous trail to the Upper Bearwallow Falls observation deck. This is a short but moderate trail to the Bearwallow Valley observation deck. 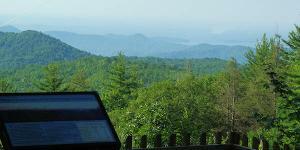 Depending on the weather, great views of the park and Lake Jocassee are possible. Location: The trail head is located at the Frozen Creek Access in Rosman, NC on Frozen Creek Road. This trail follows the eastern boundary of the park from Frozen Creek Access to the Foothills Trail. 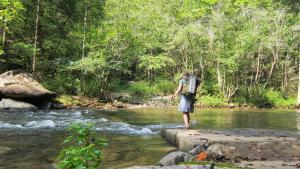 It provides access to the non reservable primitive backpack sites along the Foothills Trail along the northern tip of Lake Jocassee at the Mouth of the Toxaway River. Point of Interest: Primitive campsites and the long suspension bridge on Lake Jocassee. 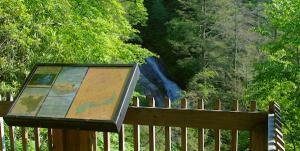 Location: The trailhead is located at the Frozen Creek access area in Rosman on Frozen Creek Road. The Foothills Trail is a 76-mile (122 km) National Recreation Trail trail in South and North Carolina, United States, for recreational hiking and backpacking. 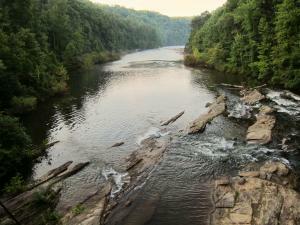 It extends from Table Rock State Park to Oconee State Park. It passes through the Andrew Pickens Ranger District of the Sumter National Forest, Ellicott Rock Wilderness, Whitewater Falls, and Lake Jocassee. The part of the trail in Gorges State Park travels through the southern back country before it wraps around Lake Jocassee and crosses a long suspension bridge to where primitive campsites are available.